Lots of measuring and thinking has gone in to getting the front suspension a little further along. As you can see in the picture, a lot of the inner guard and chassis rail is gone. There is more to be removed once the next steps are completed. 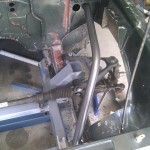 The tubing coming out of the firewall is attached to the front leg of the roll cage and will have the upper mount for the front shock absorbers on it. There will also be a brace down towards the firewall end of the rail but I need to get the engine in place first to make sure it doesn’t conflict with the mounts. 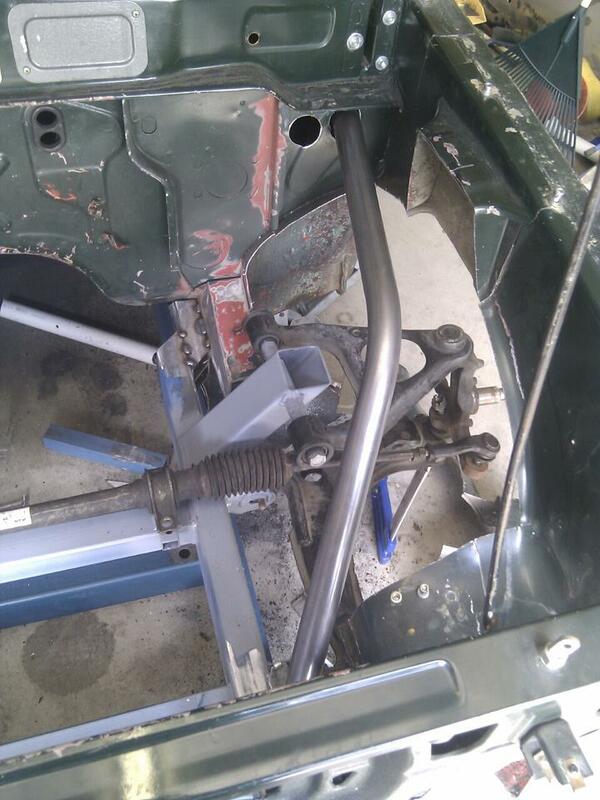 I will also need the steering column in place on the drivers side to ensure clearance on that side. Whilst there has been a lot of fiddly work to get to this next stage, I am keen to get it complete as it will mean that the car will be able to roll on it’s own suspension again. Something it has not been able to do for a couple of years.